How to use Holy Spirit discernment to know God's will, using anointed readings from the Saints & Scriptures, for simple souls seeking to fulfill their purpose in life. Chaplet of Divine Mercy music and art. 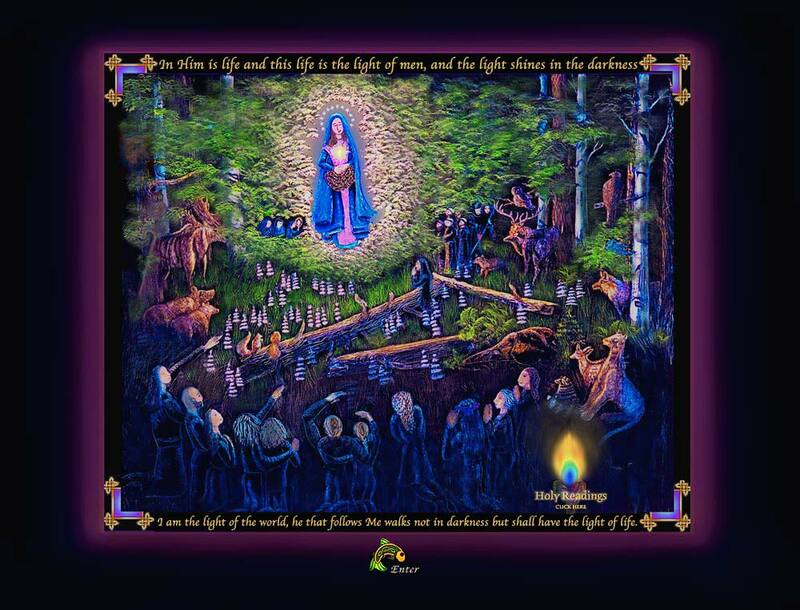 Our Lady Light of the Woods web site is designed to assist souls who are sincerely seeking to live the spiritual life, in obedience to God's known will. Discovering His will is a never ending journey into Trust and Abandonment, revealing the endless riches of His very tender, personal love and provision for each of us. Discernment is the ability to hear and recognize the Lord's instruction to us (preferably on a daily basis), and is a key skill for our confused times, wrought with many pitfalls, but none the less, urgently necessary for the soul seeking to fulfill God's plan for their life. The readings within each pool are randomly arranged. It is totally up to the Holy Spirit which reading comes up when you click on it. Please approach this prayerfully and give serious consideration to the reading you are given. While this page seems childlike and simple, any word of encouragement is something to be approached with great caution and respect. We must always seek the Holy Will of God with great purity of intention (or at the very least the sincere desire to be purified) and we are instructed to "test the spirits and see if they be of God." We are praying for each and every soul that visits this site that they will be encouraged in the direction God has for their life. More detailed instructions on discernment can be found in On Discernment, Formed By His Spirit. Through the "rhema", or anointed word from the Lord, for your time and situation, it is our hope that many will be encouraged in personal holiness and Spirit led formation. We understand that this simplistic approach to discernment will not be for everyone, God has each of us on our own unique paths. May He grant you the wisdom and courage to walk peacefully on the one He has chosen for you. Feel free to e-mail us if you have any questions we will do our best to answer your inquiries. What circumstances can set me up to be deceived? Who can I turn to for intercessory prayer when I feel all alone? On the Holy Music page you will find a new version of the Divine Mercy CD, with Divine Mercy Image, free. This version of the Divine Mercy Chaplet CD (MP3), is a mystical and contemplative version with each decade having slightly different instrumentation, and a different focus. This is a very quieting and slow version of the prayer. During the recording of this Chaplet, Pope John Paul II, (instrumental in the approval of the Divine Mercy Devotion), went to his eternal reward. The introduction to the fourth decade honors his holy passing and the John Paul Generation that kept him company in his last moments here on earth. The Divine Mercy Image also contains within it the image of the Blessed Sacrament over the Lord's Divine Heart. The Divine Mercy Painting appears in two places, Holy Art, and on the Divine Mercy CD jacket (two different versions). Please feel free to copy and use the CD as well as the art for your devotions, or to distribute without charge. The Mother of Mercy Image appears on the Holy Art page (Our Mother of Mercy II) and also on the Mother of Mercy Devotions page, (Our Mother of Mercy I). We are still recording the Rosary CD and will get each decade on the site as soon as it is completed. The Rosary CD has three parts per decade: the meditation which is a narration with music and sound effects (different) for each decade of the Rosary, the prayer intention, and the Hail Mary's. Each decade of the Rosary CD will have a different sound according to the mystery. To date we have only finished one meditation and the Our Father, but more is on the way. We would love to have your feed back on the CDs if you find them useful for prayer. A slightly different Souls in Purgatory Image also appears on the Credits page. Our Mother of Mercy & Divine Heart of God holy art. and for those with unusual charisms and those still hoping to recover a lost vocation.